Round one of the Superclásico to end all Superclásicos did not disappoint. And there’s still at least 90 more minutes to go in this epic battle for the Libtertadores crown. All that was missing, after the intense hype that accompanied Boca Juniors and River Plate’s Copa Libertadores epic ‘Game of the Century,’ was a suitably epic storm. And so the rain came belting down last Saturday, drenching Buenos Aires and its surrounding areas on a day when the Argentine capital – and particularly the area in and around Boca’s home, La Bombonera – was world news. While over in Lanús intrepid residents were taking advantage of the downpour by wakeboarding in the city’s flooded streets, millions waited anxiously to see if the first leg of the final – the only topic of conversation for the preceding 10 days – could actually take place. 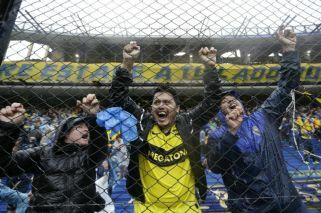 Ultimately – and despite early assurances that Boca and River would kick off as scheduled, even if the players involved were forced to ward off the advances of hungry alligators at the corner flags – common sense prevailed: the game was pushed back 24 hours, and the heavens obliged by closing up and allowing the two sides to play in conditions that closely resembled normality. In stepped an unlikely hero. Omar Suárez, a legendary figure of Argentina’s infamous, free-wheeling 1990s as the proprietor of cabaret club Cocodrilo – a favourite past haunt of Diego Maradona, Guillermo Coppola and even, as legend has it, former US President Bill Clinton – offered free entry to his establishment for any Boca supporters left stranded by the postponement, an invitation that was taken up with relish by many. As generous as Suárez was, however, not all of the travelling faithful were able to take advantage – particularly those who had journeyed from further afield than the country’s interior. While Katu was passing over the vast expanses of ocean that separate the country of his birth and the country of his football love, another plane was taking a group of fans away from home. Thirty-five orthodox Jews, faced with the dilemma of missing their beloved Boca in the final due to the clash with Shabbat, came up with a novel solution: they could fly off and watch the game from Barcelona, where due to the time difference the game would kick off after dark. Alas, the best-laid plans of mice and men (and football fans) often go awry. Saturday’s suspension meant that Katu was forced to return to Japan in the early hours of Sunday morning, unable to join the throngs in the Bombonera. While the fate of those intrepid fans who made their way to Spain is unknown, their original plans too had them returning to Argentina the following day: when, in the bitterest of ironies, they would have been free to watch the match unencumbered by religious sensibilities. Happily, when the match itself finally arrived neither Boca or River disappointed. Superclásicos tend toward the tense, the petty and the semi-violent, meaning that the 90 open, action-packed minutes of football that followed (allowing for the minute’s silence before the match, as a mark of respect to four Boca supporters who tragically lost their lives in a car crash as they drove to Buenos Aires from Chubut) came as a more than pleasant surprise. Fans’ nerves were nevertheless on a knife-edge: Radio Colonia obliged with a special heart-friendly broadcast that included commentators calling the match in a calm fashion and accompanied with soothing zen music in the background. There was even a moment of sportsmanship: when the final threatened to boil over, notoriously fractious Boca enforcer Pablo Pérez put an arm around adversary Milton Casco and warned him that a yellow would rule him out of the return fixture. A packed Bombonera exploded twice when Ramón Ábila and then substitute Darío Benedetto put the hosts in the ascendancy. But one could hear a pin drop for River’s two equalisers, a breakaway converted by Lucas Pratto seconds after the opening goal and then an unfortunate own goal from Carlos Izquierdoz, who grazed a corner past his own keeper. That unease from the heaving stands then turned into pure anguish when Benedetto, so lethal in these decisive stages of the Copa, saw his late effort stopped brilliantly by Franco Armani when Boca were already celebrating a 3-2 lead. Watching it all from afar was River coach Marcelo Gallardo, banished from the Bombonera by CONMEBOL due to his dressing-room antics in the semi-final. ‘Napoleon’ tried to keep his cool in River’s Monumental home, and appeared from the stadium’s balcony after the final whistle to gee up thousands of Millonarios who had arrived in Núñez to pay tribute to their absent hero. Back in La Boca, meanwhile, Carlos Tevez was cajoling his troops to hide their disappointment at not taking the honours in the first leg. “Keep your heads up, motherf***ers,” the Xeneize legend screamed, a foul-mouthed order to salute the thousands of fans who had braved the elements and given everything up to watch their team go so near, yet so far against their arch-rivals on the biggest stage imaginable. Thus ended a titanic battle between Argentina’s two footballing aristocrats, the first part of a duel to the death that remains tantalisingly poised. So much action, so many stories to tell – and there is still 90 minutes to go in this epic tale.